What is the FastDay Progress Tracker? 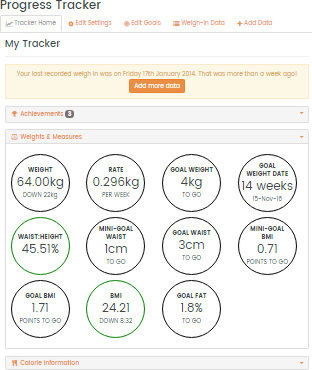 The Progress Tracker is a feature for registered FastDay members and allows you to log and chart your weight, waist & hip measurements (if known), body fat percentage (if known) and blood pressure (if known). In addition the system will calculate your BMI, various interesting & useful statistics as well as your daily calorie needs as your body shape changes. You can also specify long & short term goals which will be marked on your charts - and provide achievement badges when reached! The time to reach your goal weight is estimated for you too, based on your calculated weekly average loss. The Progress Tracker is for registered FastDay members. Please login or registrer to activate your tracker. 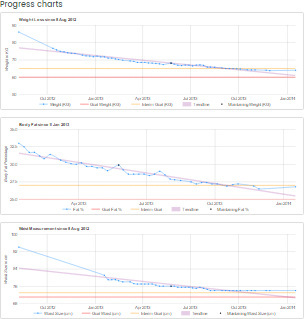 Progress Tracker system developed by Moogie © 2013-2019 and exclusive to the FastDay Forum. Graphs powered by Google Charts.